The Management Service in Novell® ZENworks® Endpoint Security Management is the central service for Endpoint Security Management. It is used to create authentication credentials, design and store security policies and their components, and provide remediation through a robust reporting service. It provides security policies and user information to the Policy Distribution Service, as well as providing opaque credentials to Endpoint Security Clients. 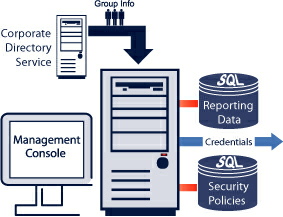 Security policies, credentials, and reports are stored in an SQL database(s), which may reside on the same server as the Management Service or on remote servers.